The Secretary of State is of tour for Middle East and recently said in Saudi Arabia that the Persian régime has "behaved worse" since the signature of the treaty and it continues being "the biggest support of the terrorism in the world." He also confirmed that they will look for "readapt" the agreement, or, otherwise, president Trump will order the exit of US from the agreement. 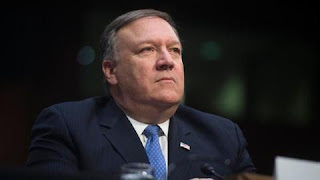 The recently confirmed new Secretary of State from United States, Mike Pompeo, threatened this Sunday with breaking up the nuclear agreement with Iran during a visit to Saudi Arabia, the main partner of Washington in the Arabic World and the biggest rival of the Persian régime. In the second day of their visit, Pompeo attacked against Iran and the agreement signed in 2015 by Barack Obama’s Government, a pact that in his opinion “has failed" in the purpose of "moderating" the Iranian régime. "Iran has behaved worse in many areas sin the signature of the agreement", said the politician during a brief declaration to the press, beside its Saudi homologous, Adel al Jubeir. The head of United States’ diplomacy also assured that his country will work with its European partners to "readapt" the nuclear agreement and, “if it is not possible" to reach a new pact, the president Donald Trump will retire from the country. It is expected before May 12 that Trump announces if he will continue in the agreement. That’s the limit date that the president has to inform the American Congress about the state of execution of the nuclear pact subscribed between Iran, United Kingdom, France, China, Russia and Germany, besides United States. The American president has always been very critical with the text signed by Obama, especially because it doesn't regulate the use of ballistic missiles of Teheran, neither his international operations. Pompeo said about this theme, that, on the contrary of the previous one, the present Administration won't neglect the support given to terrorism by Iran. The ex-director of CIA, confirmed in its new position by the Senate on Friday, recriminated Teheran’s support to Al Assad’s régime and the forces in Yemen, enemies of Saudi Arabia. Pompeo assured that, for Washington, it is a "priority" the security of Saudi Arabia, at the same time that he reiterated US military support to the ultraconservative wahabbi Kingdom. On the other side, he praised Riad’s reformations program, which, according to him, “promotes tolerance" and "encourages women."